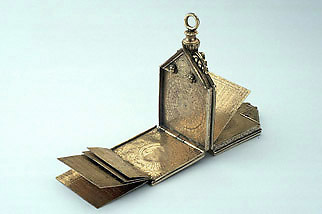 This elaborately decorated and multi-leafed compendium is in the form of a square box with triangular pediment. A swivelling suspension ring mounted on an urn-shaped support is fixed at the apex of the pediment. All free surfaces carry foliate engraving and the covers are decorated with strapwork, heads, foliage and fruit. In the centre of the square frame of the front cover is an embossed ovoid carrying a coat of arms emblazoned with an esquire's helmet. A corresponding oval on the back cover is inscribed '+ Aske + me + not + for + ye + Gett + me + not + + R + P +'. The outward faces of the triangular pediment are also decorated. Each carries a pair of heads, one of which acts as a catch for the hinged square section of the back cover. In addition, the front pediment is engraved with an armillary sphere and two quadrants, while the back has the reverse of an astrolabe. Another similar compendium also signed by V. C. and dated 1557 is in the Adler Planetarium in Chicago. It differs in its outward form, having a semicircular mounting rather than a triangular pediment. However, the decorative scheme, although differing in details, is closely related. Recessed inside the front cover is an engraved circular plate with a circumpolar diagram of the Great and Little Bear constellations. The centre is marked '+ POLVS' with 'STELA . POLARIS' beside it in the tail of '. VRSA . MINOR .'. A dotted line joins the two guard stars in 'VRSA MAIOR' to the pole. This plate also features in the 1557 Adler example but its engraver has used a different iconographic model for the form of the two bears. The polar plate was provided to accompany a nocturnal housed directly above it. Now detached, the nocturnal was originally fixed to a hinged support which both served as a handle and allowed the nocturnal to be swung clear of the body of the compendium. The signature 'V C' appears on the support. The nocturnal is constructed for use with a star whose right ascension is that of the first point of Scorpio. The nocturnal's outer ring carries a zodiac scale. Each sign is identified by its symbol, divided to 10 and 2, and numbered by 10. (A zodiac-calendar scale is provided elsewhere in the compendium.) The hour scale runs from 3 to 12 to 9. The hours are numbered to increase clockwise rather than the more common anti-clockwise direction (as is found on the 1557 Adler example). To read hours from the scale (as opposed to counting them out in the dark by feeling the sequence of projecting studs), the observer must therefore look through the central hole of the nocturnal from the back rather than the front of the device. The reverse of the nocturnal carries a table of the latitudes of 16 British towns, within a decorated frame. A thin rod, which also provides the gnomon edge, is supplied to support the dial plate at the chosen elevation. The rod (53 mm in length) is housed in the hollow edge of the dial plate. Its cross section is a rounded wedge and it is inserted into the hollow sleeve of the clinometer's leading edge. The rod's sharp edge projects through the slit in the clinometer sleeve to serve as the gnomon for the upper face (while also ensuring that the clinometer remains perpendicular to the dial plate). Pushed through the hole in the dial plate the rod acts both as the gnomon for the lower face and also rests on the face of the next plate to maintain the dial plate's elevation. The reverse of the clinometer square has a circular scale of degrees 10 to 90, 10 to 90, 90 to 10, 10 to 90, divided to 10 and 2, and numbered by 10. Engraved inside the scale is a depiction of an armillary sphere. The equinoctial dial also serves as a lunar dial, with a fixed lunar scale 0 to 291/2 placed inside each circular scale of hours. Rotating inside each lunar scale is a volvelle, which is set for the age of moon by a small projecting pin. The volvelles have been mounted on the wrong sides of the leaf so that their scales of hours from 4 to 12 to 8 increase in the wrong directions. Each volvelle also has a circular aperture giving a visual indication of the phases of the moon corresponding to the value set on the fixed lunar scale. The upper face of the next leaf carries a horizontal sundial and a quadratum nauticum. The hour scale of the dial is placed around the outer edge of three sides of the leaf, showing the hours 4 to 12 to 8, divided by 1 and 1/2 . The dial would probably have been provided with a folding gnomon, which does not survive. This is the arrangement on the 1557 Adler example, and holes for the retaining pivot points are found in the same place here. Each of the outer edges of the quadratum nauticum carries a typical scale for longitude or latitude, 90 to 0 to 90, divided by 10 and 2, and numbered by 10. Within are the 32 radiating lines for the points of the compass, with the eight principal directions marked in an uncertain mixture of French and English: 'NORTH', 'NORTH EST', 'EST', ' SV EST', 'SV', 'SV OVEST', 'OVEST' and 'NORTH OVEST'. No other parts of the instrument are marked in French. The maker may have been copying a French model of the quadratum nauticum, but in other respects Digges's Prognostication again provides a close match. Like Digges, but unlike Gemma Frisius's original publication or the astrolabes of Humphrey Cole, the compendium's quadratum lacks the orthogonal network of lines at 30? intervals linking the pairs of longitude and latitude scales. The reverse of the leaf carries a table giving the time of day break and sunrise, the length of the day and night, and the time of sunset and twilight for the first, tenth and twentieth of every month. The table is copied from Leonard Digges's Prognostication of Right Good Effect. In the 1555 edition published by the printer and instrument maker Thomas Gemini the table appears at sig. F ijv. The next leaf carries the compendium's handle and ring, and has a compass with blued needle inset into the upper face of its triangular pediment. The compass is visible when either the equinoctial or the horizontal dials are in use. On the same face, is a circular almanac for the sun and moon. The two fixed outer scales provide a zodiac-calendar for the position of the sun; the signs of the zodiac are divided in degrees to 5 and 1, and numbered by 5; the months are divided in days by 10 and 1, and numbered by 10 (except when the month has 31 or 28 days). An inner volvelle has a circular aperture to show the phases of the moon, corresponding with the moon's age as shown by the index. There is also a diagram of aspects, engraved for trine, quadrature and sextile. The reverse of the leaf has a circular solar table for the years 1554 to 1579, with the sun engraved at its centre. The table provides 'AVREVS NVMERVS', 'INTARVAL', 'LVM [caret]' (or , 'INTARVALLVM [caret]') and 'SONDAY LETER' for these years. The inner face of the back cover carries a circular lunar table corresponding to the solar table facing it. It also runs from 1554 to 1579 and gives the epact ('LVNACO<N>') in days, hours and minutes. The face of the crescent moon is engraved at the centre of the table. Hinged on the outer edge of this leaf and lying between the lunar and solar tables are four further plates. The first three faces provide a general calendar, according to the format used in Digges's Prognostication: each day is given its golden letter and the calendar is marked for the days when the sun enters a sign of the zodiac. The saint's days selected for inclusion match those used by Digges. Both of these first two almanac plates have snapped, but the detached pieces have survived. The reverse of the second plate carries a table to find what sign of zodiac the moon is in for any day of the year, along with a note of whether it is good or bad to either let blood, purge or bathe on that day. On the recto and part verso of plate 3 is a table of moveable feasts, which again follows Digges. The remaining space is taken up with two tide tables from Digges. See R. T. Gunther, Early Science in Oxford, (14 vols, Oxford, 1923-45), vol. 2, pp. 127-8 and pp. 279-84. For the compendium by V. C. at the Adler Planetarium, see L. Janin, "Un compendium de poche par Humphrey Cole 1557", Annali dell'Istituto e Museo de Storia della Scienza, 1 (part 2, 1976), pp. 9-12.